Reading fall books about the autumn aloud with your children is a great way to celebrate the fall season and learn more about it. 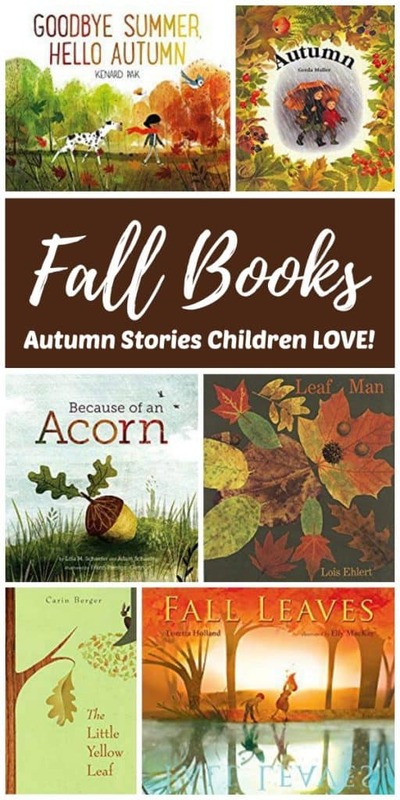 Read books about the fall to enjoy the autumn season with your kids today! My daughter and I love reading seasonal books throughout the year. Read any book in this collection of fall books as a way to celebrate the autumn season and learn more about it. Reading aloud to our children is a great way to connect with them and increase their love of reading and learning. Even when they are reading on their own, it’s a good idea to spend time reading aloud to them as a way to share meaning and connection through the passing seasons of our lives. Related: Fall Bucket List for the Best Autumn Ever! Check out our favorite fall books below! Head to your local library to see if any of these titles are available this autumn, or use the affiliate links to buy your own. If you click to purchase I may earn a small commission at no cost to you. Take a walk with a young girl greeting all the signs of the coming season. In a series of conversations with every flower and creature and gust of wind, she says goodbye to summer and welcomes autumn. My daughter and I love this book because it reminds us of our signs of fall scavenger hunt. We like to search for signs of the changing seasons and have a scavenger hunt for each season! One in a series of four books about each season without text. 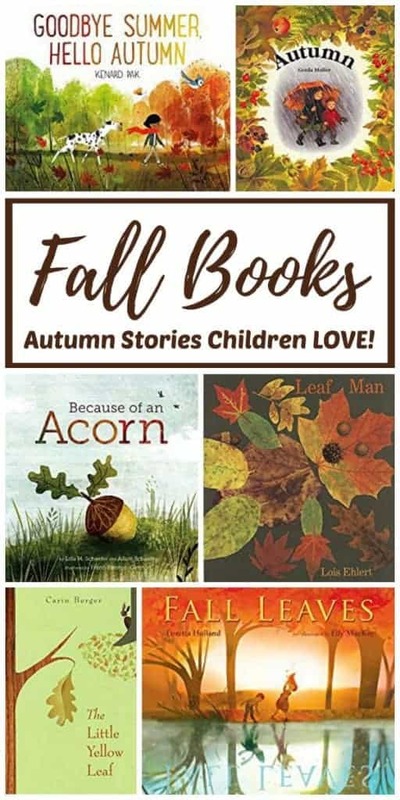 A magical collection of picture books that recreate the spirit of each season so children can look at them on their own. Muller’s book about Autumn is full of fun, active illustrations including the joys of playing in leaves, flying kites and making jam. For many cultures around the world, the fall equinox has been a time to celebrate the harvest and begin collecting and storing crops. Reading this book about the autumnal equinox with your children can help inspire a new understanding of autumn and the harvest season. This book has been a source of artistic inspiration for my daughter and I. We created our own fall leaf art after gazing upon the amazing nature art found in this gorgeous book. The rich pictures and evocative autumn imagery makes this fall book a magical place for children. A girl spends the day picking apples and searching for the perfect pumpkin in this refreshing classic autumn book about the fall season. The author mixes sights and sounds of the autumn up in this silly little fall book from Bob Raczka! Can you find his mistakes in the words and pictures? Hello, Fall! is a touching story of the autumn season. A granddaughter and her grandfather welcome fall in this sweet, whimsical story about finding beauty and wonder in every moment. It’s fall and the leaves are changing color. This classic autumn picture book features graceful text and simple, fun diagrams to explain concepts like photosynthesis and the different types of leaves. This book also includes simple ideas and activities to do with leaves during the fall. Three friends go on a big adventure over a mountain and through a forest to collect fall leaves of all kinds and colors. Can you guess what they are going to do with all of the gorgeous fall leaves that they have collected? Paper sculpture is used to illustrate the animal life, plant life, weather, colors, clothing, and feelings associated with the fall season in this beautiful autumn book. As the leaves fall from his favorite tree, Fletcher begins to worry that there is something is terribly wrong. But when winter comes with a wonderful surprise her realizes that everything is not only okay… it’s beautiful! The unique changing nature of the beauty that defines Autumn is captured in this book about the fall. In the middle of fall, it takes only one gust of wind to turn the whole world yellow and red and orange. Count backward from 10 to one with the author of this book about autumn. Learn about the bright, colorful leaves, the trees from which they fall. Watch the animals frolicking in the crisp, autumn air as they get ready for the approaching cold winter in this sweet little book about fall. In this book about fall, the author brings us a wonderful introduction to the science of seasons for leaf jumpers everywhere. The poetic simple text shares facts about different types of fall leaves. Reading this book makes it easy for children to learn about leaves and how to identify them. What is the busy little squirrel doing? Why doesn’t he have any time and why does he look so busy? Find out in this sweet little story about a busy little squirrel. Enjoy beautiful watercolor illustrations and sweet fall story about how the world changes during the autumn season. Reading books to children is a wonderful way to teach them and connect with them. I also like to use children’s books to make parenting a bit easier to navigate. Check out this awesome collection of kids books that teach important life lessons, and books that help children understand their feelings for some of our favorites! Don’t forget to check out our Fall bucket list for the best Autumn EVER! !